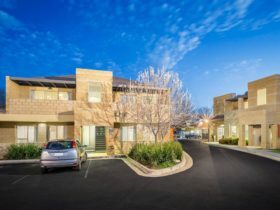 BIG4 Wagga Wagga Holiday is perfectly located on the banks of the Murrumbidgee River and close to all the great attractions and local services of Wagga Wagga. This holiday park offers a wonderful family-friendly atmosphere with plenty of space to relax and enjoy the peaceful riverside location, Pets are welcome to stay on caravan and camping sites (on management approval), along with selected accommodation. 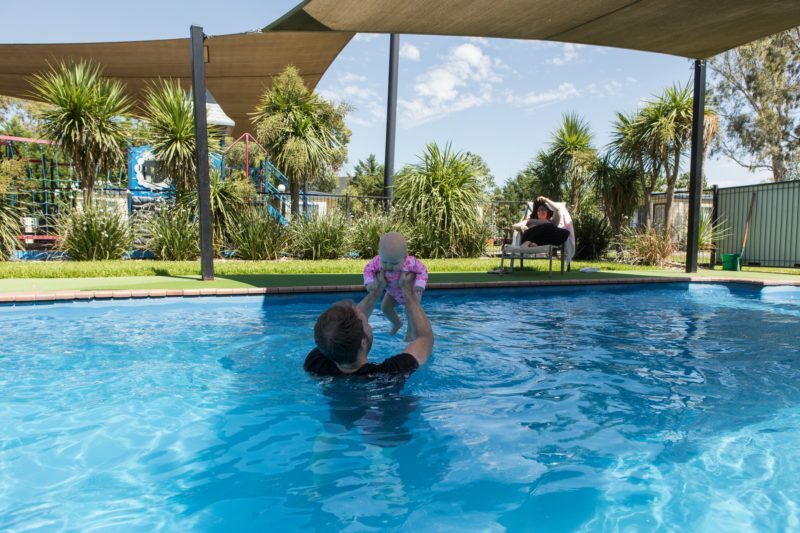 Relax as the kids play on the adventure playground, have a swim in the pool or enjoy a barbecue in their fully-equipped camp kitchen. Stroll down to the river, which is great for fishing and you can also launch your boat from their private boat ramp. Come, stay, explore! Choose from a range of accommodation styles from two bedroom units, large shady drive-through powered caravan sites and well-grassed tent sites. For those looking for a spacious and luxurious stay, these cabins feature two separate bedrooms with a comfortable large open-plan living area. These modern cabins feature air-conditioning, a fully self-contained kitchen; two separate bedrooms, one with a queen-size bed and the other with two single beds (all linen included); full bathroom and a balcony with outdoor setting. 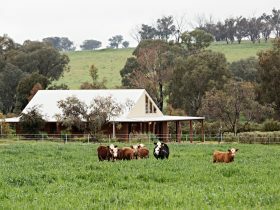 Their newest accommodation in the park is perfect for up to five people and would be the ideal choice for two couples travelling together. 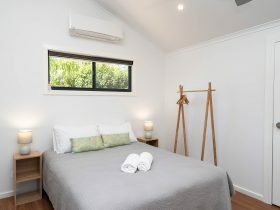 The main bedroom has a queen-size bed, while the second bedroom has a double bed, with a single drop-down bunk above (all linen included). These modern cabins enjoy air-conditioning; a larger open-plan living area; fully self-contained kitchen; full bathroom and a lovely large balcony. Looking for holiday accommodation for a medium to a large family? 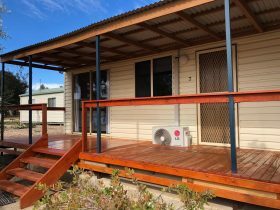 These Family Cabins feature two bedrooms with a queen bed in the main bedroom and the second bedroom has been fitted with two sets of bunk beds. This allows for a maximum of six people in the cabin. However, children must be over nine years old to use the top bunks. With a large open-plan living area, this is a comfortable option for a larger family. These cabins feature two separate bedrooms, with a queen-size bed in the main bedroom and two sets of single bunks in the second bedroom (all linen provided); air-conditioning; self-contained kitchen with full facilities; full bathroom with shower and toilet. They are located close to the pool and playground and just a short stroll to the barbecue/Camp Kitchen area. Looking for holiday accommodation for a medium to a large family? 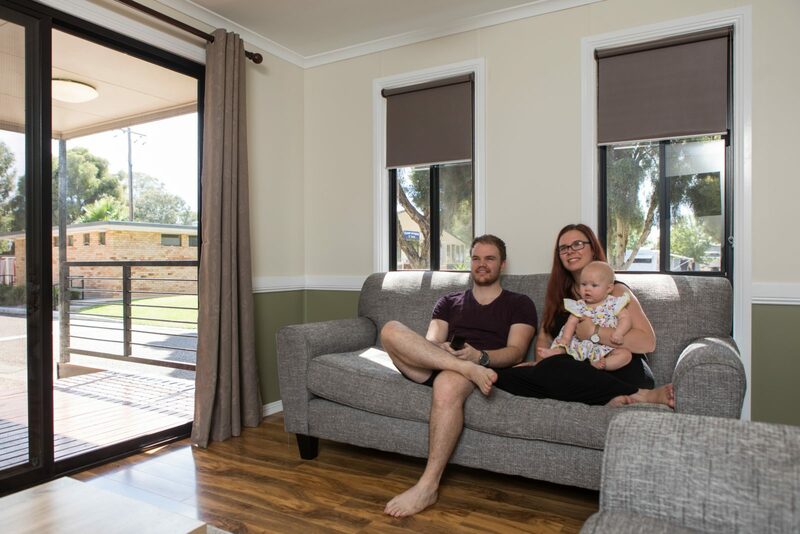 These Family Cabins feature two bedrooms with a queen-size bed in the main bedroom, while the second bedroom has been fitted with a tri-bunk bed, which has a double bed on the bottom and a single bunk bed over the top (all linen provided). This allows for a maximum of five people in the cabin (please take into account that children must be nine years or older to use the top bunk). With a large open-plan living area, other features include air-conditioning; self-contained kitchen with full facilities; bathroom with full facilities. Close to the pool and playground and just a quick stroll to the barbecue/Camp Kitchen area. Ideal for couples or small families looking to get away on a holiday. Featuring everything you need in one cabin, including full kitchen facilities and bathroom facilities. Sleeping for up to four people makes these cabins ideal for small families or couples on holiday getaway. 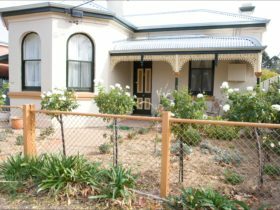 Featuring air-conditioning; shower, toilet and bathroom facilities; a queen size bed in the main bedroom and two single bunks in the hallway (all linen included); self-contained kitchen with full facilities and veranda with outdoor setting. Ideal for those looking a quick stay-over or a cabin with all the basics. Sleeping for up to four people, these cabins are ideal for families on a quick get-away or on a budget holiday. 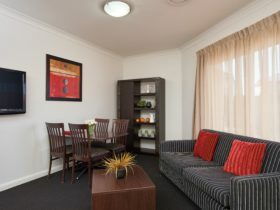 These compact units vary in decor style, but all feature air-conditioning; shower, toilet and bathroom facilities; a double bed in the main bedroom with two single bunks in the hallway; all linen included; self-contained kitchen with full facilities and all just a quick stroll to the pool or playground facilities. A limited number of these cabins are pet-friendly, please give their friendly team a call to discuss your pet and travel needs. 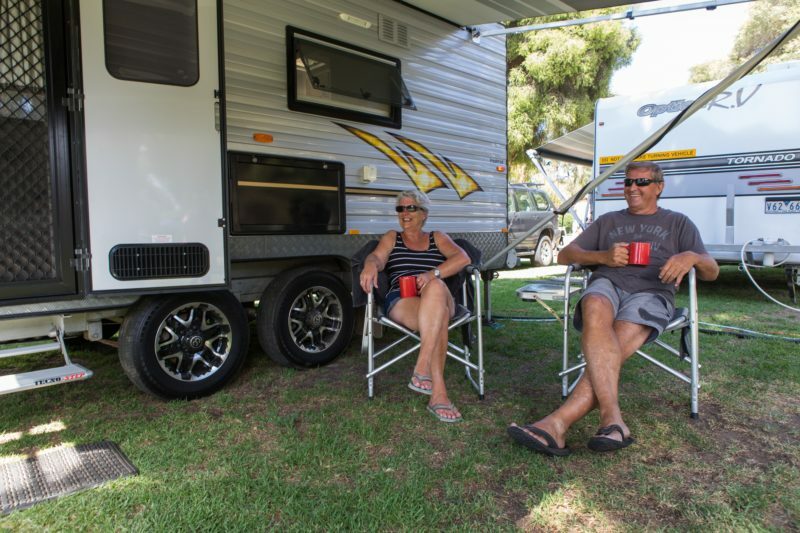 They have a huge selection of powered caravan, motor home and camping sites, all of which are pet-friendly on application, not to mention access to their fantastic all-weather Camp Kitchen and spotless Amenities. You might like to choose one of their Powered En suite Sites if you like the convenience of your own private bathroom facilities. Their drive-through sites are perfect for larger rigs or those who don’t want to unhitch and are available in gravel or grass surface. They also have regular powered sites with your choice of concrete slab or gravel. Campers with tents or camper trailers will love the Powered Grass Tent Sites located close to the Camp Kitchen and Amenities. And for those who want to unplug, they have a spacious unpowered grassy camping area with access to the Camp Kitchen, Laundry and Amenities. Prices are for two guests and additional tariffs apply for extra persons.